Objective: To assess the efficacy and safety of transcatheter closure (TCC) of patent ductus arteriosus (PDA) with severe pulmonary arterial hypertension (PHT). Background: TCC of small and moderate-sized PDAs is well established. However, there is a paucity of data on TCC of large PDA with severe PHT. Methods: This is a retrospective observational study of 76 patients with large PDA and severe PHT who were referred for TCC. Multiple clinical and investigational parameters were evaluated to decide the reversibility of PHT. Following the TCC, patients were serially followed up to assess the efficacy and safety of closure and its impact on PHT. Results: Of 76 patients, nine were found to have PDA with Eisenmenger's syndrome. Of remaining 67, two were thought to have irreversible PHT based on hemodynamic data obtained after balloon occlusion of the duct. Sixty five patients, who eventually underwent TCC of PDA, had a median age of 9.1 years (range 1 month to 40 years). The weight ranged between 2.5 to 62 kg (median 14 kg). The PDA size was 9.1 ± 4.6 mm. The mean systolic pulmonary artery pressure was 66.9 ± 15.3 mm Hg. Duct occluder was used in 63 and muscular ventricular septal defect closure device in 2. The follow up was available in 56 (86%) with a mean follow up period of 65 ± 34 months. All the patients had complete closure of the PDA at 6 months follow up. Mild obstruction of left pulmonary artery (n=3) and aortic isthmus flow (n=6) was noted at the time of discharge. During the follow up, partial or complete resolution of PHT was observed in all the patients in whom Doppler-derived right ventricular systolic pressure was recorded (available in 40 of 56 patients). Conclusions: TCC of large PDA with severe PHT and significant left to right shunt was found to be effective and safe in the short and intermediate term. Whether to attempt transcatheter closure (TCC) of patent ductus arteriosus (PDA) in patients with severe pulmonary hypertension (PHT) remains a challenging clinical problem. In neonates and infants, PHT is most often reversible, but in older patients the resolution of PHT is variable depending on the reversibility of pulmonary vascular resistance (PVR). Although, advances in transcatheter techniques have made TCC of large PDAs technically feasible, there is a paucity of data on patient selection, technical considerations, acute complications, and long-term results related to this subset of patients. ,, This study highlights the importance of using multiple clinical and investigational parameters including test balloon occlusion of the PDA in selecting the patients and also reports short- and intermediate-term follow up results. Between December 1998 and January 2010, 756 patients underwent TCC of PDA. During this period, 76 patients with PDA having severe PHT were referred for TCC. For the purpose of this study, severe PHT was defined as pulmonary artery systolic pressure more than 2/3 of systolic aortic pressure (recorded during cardiac catheterization). The data were collected retrospectively from the case sheets and the catheterization records. Informed consent was obtained from all patients. Multiple clinical and investigational parameters were used to determine reversibility of PHT. Upper and lower limb saturations were recorded at baseline and on exercise when necessary. Postexercise saturation of < 90% was considered as being suggestive of irreversible PVR and when saturation was between 90% to 95%, they were subjected to cardiac catheterization. A detailed Doppler echocardiographic evaluation was done to define the size of the PDA, and estimation of the pulmonary artery pressure (PAP). Specific attention was paid to rule out associated aortic coarctation and branch pulmonary artery stenosis. General anaesthesia (thiopentone sodium, norcurone, and sevoflurane) was used in all patients during the procedure and inspiratory oxygen was maintained between 35% to 50%. At cardiac catheterization, baseline oxygen content and pressures were recorded at the various sites. In those with systolic PAP > 90% of systemic pressure, balloon occlusion (Equalizer 20 or 27 mm, Boston Scientific, Natick, MA, USA) of the PDA was performed [Figure 1]a and the systemic and PAP were compared before and after the balloon occlusion for 15 min [Figure 1]b. For PDA less than 16 mm in diameter, 20 mm balloon was tracked over a super stiff Amplatzer guidewire (Boston Scientific, Natick, MA, USA), inflated in the main pulmonary artery and pushed against the pulmonary end of the PDA. For ducts larger than 16 mm, 27 mm occlusion balloon was used. Any fall in systolic PAP of > 20% of the baseline pressure was considered as an indicator of significant left to right shunt across duct contributing to PHT. 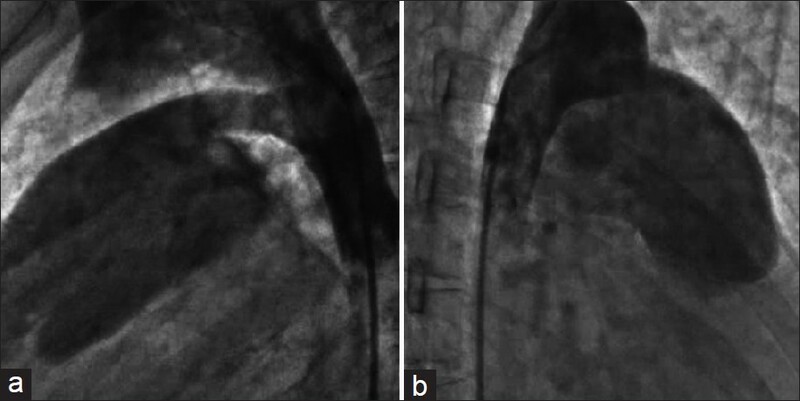 Diagnostic angiograms were performed in left lateral [Figure 2]a and [Figure 3]b and right anterior oblique 30° [Figure 2]b and [Figure 3]a to profile the anatomy of PDA which included estimating its diameter at the pulmonary and aortic ends, and its length. The duct size was described as per its diameter at the pulmonary end. If the PDA was found suitable for closure, Amplatzer ductal occluder (ADO, AGA medical corporation, Plymouth, MN, USA) was used in all those with duct size ≤ 14 mm. For ducts larger than 14 mm, other ductal occluders (Lifetech Scientific Ltd, Shenzen, China and Cocoon Vascular Innovation Nonthaburi, Thailand,) or Amplatzer muscular septal defect occluder (AMVSDO, AGA medical corporation, Plymouth, MN, USA) were used. The PDA was crossed from the pulmonary end in all the patients. Amplatzer delivery sheath (AGA Medical, Plymouth, MN) was introduced from the venous route over Amplatzer super stiff guide wire (Boston Scientific, Natick, MA, USA), and was parked in the descending thoracic aorta. The device size used was the same as the angiographic size in newborns and infants or one size more in the older population. Device was delivered as per the standard technique described earlier. ,, Aortogram was done at 10 min after the release to confirm device position and rule out residual shunt. Postprocedure, the patients were monitored in the intensive cardiac care unit for 24 h. A close watch was kept for any evidence of intravascular hemolysis and device embolization. Patients were discharged on the next day except the neonates and young infants who were ventilator dependent. All cases were followed at 6 weeks, 6 months and every year thereafter. Improvement in functional class and weight gain were noted. The patients were evaluated clinically for any evidence of worsening of PHT. At follow up echocardiography, the position of the device was confirmed and residual shunt if any was noted. The presence of turbulence in the left pulmonary artery (LPA) and aortic isthmus was looked for and the velocities/gradients across these structures were recorded. The PAP was estimated with tricuspid regurgitation jet on follow up. Repeat catheterization was not done in any case. Tablet aspirin (150 mg or 5 mg/kg/day) was given for 6 months till 2007. Since then, the use of Aspirin in patients undergoing TCC of PDA has been stopped in our centre. Continuous variables have been summarized as mean with standard deviation or median with range as deemed suitable. During study period, 76 patients with PDA were found to have severe PHT. Clinical examination, ECG, x-ray chest and 2-D echocardiography (2DE) with color Doppler revealed irreversible PVR in six patients. Additional three patients were considered unsuitable for PDA closure due to significant fall (< 90%) in the lower limb saturation following exercise. Out of the remaining 67 patients with severe PHT, two were found to be unsuitable on the basis of temporary balloon occlusion and were therefore not subjected to TCC. With these exclusion criteria, there was a possibility of some patients being denied the benefits of PDA closure. Out of 65 patients who underwent TCC of PDA, there were 37 males and 28 females. Age distribution is shown in [Table 1]. The age ranged from 1 month to 38 years (median 9.1 years). The weight varied between 2.5 to 62 kg (median 14 kg). All patients were symptomatic; four neonates being ventilator dependent. PDA was the only hemodynamically significant lesion in all the patients. Associated anomalies included patent foramen ovale/small atrial septal defect (7), bicommissural aortic valve (6) valvar pulmonary stenosis (2) and small ventricular septal defect (2). None of these defects required any intervention. The duct diameter on echo ranged from 3.8 to 22 mm (median of 8.1 mm). The mean systolic pulmonary artery and aortic systolic pressures were 66.9 ± 15.3 mmHg and 89 + 17.2 mmHg, respectively. Angiographically, the PDA size varied from 3.9 to 21.6 mm (median 8.1 mm). The pulmonary artery systolic pressure was less than 90% of aortic systolic pressure in 56 cases. All of them had predominantly left to right shunt based on clinical and investigational criteria with lower limb saturations of > 95%. They were subjected to TCC without any further evaluation. In 11 patients with pulmonary artery systolic pressure >90% of aortic systolic pressure, four were in age group 5 to 15 years and seven were > 15 years of age. In this subset of patients, balloon occlusion of PDA was done prior to proceeding with TCC. The pulmonary artery and aortic pressures were recorded at baseline and after 15 min of balloon occlusion. In the 9/11 patients, there was a significant fall in pulmonary artery systolic pressure (>20% of baseline). This was considered as being indicative of reversibility of PHT [Table 2]. The remaining two patients in whom the PAP fell by < 20% were considered unsuitable for TCC. In all the cases, balloon was stable during the occlusion studies. The size of ductal occluders used ranged from 6 × 4 to 24 × 22 mm (median 12×10). In two cases AMSVDOs of 20 mm were used because duct occluders of that size were not available at that time. In this study, out of ten cases with ducts larger than 14 mm we used two AMVSDO, six ductal occluder of 18 × 16 and two ductal occluders of 24 × 22 mm. All the 65 patients who were considered suitable for TCC underwent successful closure of PDA. There was no incidence of device migration or embolization. Neonates, who were ventilator dependent, were extubated within 48 h of intervention and discharged within 7 days. At the time of post deployment angiogram, 62 out of 65 patients showed residual shunt through the device. However, it disappeared over a period of time and there was no residual shunt in any of the patients at the time of the last follow up. Significant hypotension (50% drop in aortic systolic pressure) along with ST-T changes in inferior leads were noted in five infants and four neonates as soon as super-stiff guide wire was parked in descending thoracic aorta [Figure 4]a and b. Hemodynamic stability was regained in 7/9 as soon as stiff wire was removed after placing the delivery sheath in the descending aorta. In the remaining two babies, the blood pressure and ECG normalized only after the device was released from the cable. One patient with a residual shunt had self-resolving acute hemolysis lasting for 48 h that was managed conservatively. At the time of pre discharge echocardiography, three patients (two neonates and one infant) had a mild flow acceleration in their LPA with a maximum velocity of > 2 m/s but < 2.5 m/s while six (three neonates and three infants) patients had peak velocity of > 2 m/s but less than 2.5 m/s in the region of the aortic isthmus due to the protrusion of aortic retention disc into the aortic lumen. Transient loss of lower limb pulses was observed in one neonate and three infants. Follow up is available in 56 patients for a period of 65 ± 34 months. During the follow up, the PAP could be estimated by tricuspid regurgitation jet in 40 of them. 34/40 patients had an estimated PAP of < 50 mm Hg. In the remaining six cases although the PAP was estimated to be > 50 mm Hg, it was significantly lower than the preprocedural PAP. None of the patients showed any evidence of worsening of the PHT. At the time of the last follow-up, all the patients were either asymptomatic or in the NYHA class I. During the follow up period, none of the patients had any progression in their peak velocities or gradients across the LPA or the aortic isthmus. On the contrary, three out of these nine patients have velocities less than 2 m/s when seen last. Of 11 patients who were considered to have irreversible PVR, one died after a period of 66 months from the time of catheterization, six had gradual worsening of symptoms (from NYHA II to III) over a period of 75 ± 21 months, while two patients remained status quo during the follow up of 44 and 33 months, respectively. Three other patients were lost to follow up. All of them were treated with sildenafil and/or bosentan. Case selection and determining reversibility of PHT : Patients with large PDAs present as a clinical spectrum ranging from a ventilator-dependent newborn, symptomatic infant, near asymptomatic child to an adolescent with severe pulmonary hypertension and Eisenmenger's syndrome. The decision to close a large duct may be straightforward, or may require investigations including hemodynamic assessment and clinical judgement. Every patient with ductus and severe pulmonary hypertension should be evaluated for evidence of significant left to right shunt utilizing clinical examination, chest X ray, ECG, Echo Doppler and if necessary, hemodynamic assessment at cardiac catheterization to ensure satisfactory long term outcome after device closure, as highlighted by this study as well as by the previous reports. , However, there always remains a distinct possibility of denying the benefit of TCC of PDA to those who were excluded due to what was thought to be irreversible PVR. Assessment of PVR at cardiac catheterization after administering 100% oxygen, and after nitric oxide has several limitations in a patient with PDA. ,, In the case of PDA, the exact site of sampling distal to the shunt also remains controversial since the precise streaming of the ductal flow is not universal. Moreover, mean PAP can be underestimated in the presence of pulmonary regurgitation. This is a unique problem seen during the TCC of hypertensive PDAs in newborns and small infants. Although the exact mechanism of this phenomenon is not known, we hypothesize that the passage of the super stiff wire and/or the delivery sheath into the descending aorta tends to pull it down resulting in pulling up the ascending aorta with a resultant stretch on the right coronary artery producing right/ biventricular ischemia with severe reduction in the cardiac output. The problem is compounded by the presence of pulmonary regurgitation produced by the wire and sheath traversing the pulmonary valve. This may result in acute volume overload of right ventricle in addition to the pressure overload due to severe PHT. The most important thing is to be quick once the super stiff wire goes into the descending aorta. The delivery sheath and the device should be kept absolutely ready for deployment. This helps in shortening the duration of ischemia. Although we did not encounter any serious consequences, it is possible that longer duration of ischemia can be detrimental to the extent of being life threatening. All the resuscitative measures should therefore be kept in a ready state during this phase of the procedure. There is no unanimity on the type of device to be used for closing large PDAs with severe PHT. ADO is available up to 16×14 mm. For defects larger than 14 mm, AMVSDO or duct occluders of other makes (Lifetech and Cocoon) can be used. These duct occluders are available up to 24 × 22. In this study, all ducts could be closed successfully without any technical problems. There is a report of successful closure of large ducts using other makes of duct occluder (Starway Medical technology Inc, China). In that series, ducts larger than 13 mm were closed in 44 cases (Mean ductal diameter 18.4 mm + 6.3 mm and device size 21.6 mm + 5.5 mm) with successful outcome. In another report, PDAs with PHT (seven cases), having duct diameters of 9.8 mm + 1.7 mm were closed with AMVSDO. Our data clearly indicates that even large PDAs with severe reversible PHT can be safely closed with a ductal occluder of appropriate size without added risk of device embolization. We do not see any extra advantage of using AMVSDO which is bulkier in profile and more expensive. Hemolysis is a rare and well documented complication of incomplete PDA closure with significant residual shunt sometimes requiring complete closure of the shunt with the use of more coils, glue or surgery. Most often the hemolysis is self limiting as it happened in our patient. Fall of PAP in the long term is the hallmark of successful closure of PDA with severe PHT. Though accurate PAP could be estimated by tricuspid regurgitation jet in only 40/56 of cases, none of the remaining 16 patients showed any indirect evidence of worsening of the PHT. This fact supports the use of multiple variables in selecting the patients appropriately. This is a retrospective study and the follow up information was available in 56 of the 65 patients. Many of the criteria used for deciding the reversibility of the PAP have been qualitative and have not been compared with the more established variables such as PVR. Patients with presumed irreversible PHT on clinical evaluation did not undergo cardiac catheterization thereby raising the possibility that some patients who would otherwise have benefited, might have been denied device closure. There is no direct estimation of PAP on follow up since repeat cardiac catheterization was not done in any patient. Large PDAs with severe PHT can be closed safely and effectively in selected group of patients. Use of clinical, radiological, ECG, echo Doppler, and hemodynamic parameters is essential for proper case selection. Test occlusion of PDA with a balloon can help in decision making in borderline cases. Infants and neonates with severe PHT need special attention during duct closure as they are prone to intraprocedural hemodynamic instability and compromise of aortic lumen. 1. Moore P, Brook M, Heymann M, Patent ductus arteriosus and aortopulmonay window. In: Allen H, Driscoll D, Shaddy R, Feltes T, editors. Moss and Adams' Heart disease in infant children and adolescent. 7 th ed, Philadelphia: Lippincott Williams and Wilkins; 2008. p. 683-702. 2. Yang SW, Zhou YJ, Hu DY, Liu YY, Shi DM, Guo YH, et al. Feasibility and safety of transcatheter intervention for complex patent ductus arteriosus. Angiology 2010;61:372-6. 3. Yan C, Zhao S, Jiang S, Xu Z, Huang L, Zheng H, et al. Transcatheter closure of patent ductus arteriosus with severe pulmonary arterial hypertension in adults. Heart 2007;93:514-8. 4. Masura J, Walsh KP, Thanopoulous B, Chan C, Bass J, Goussous Y, et al. Catheter closure of moderate-large sized patent ductus arteriosus using the new Amplatzer duct occluder: immediate and short-term results. 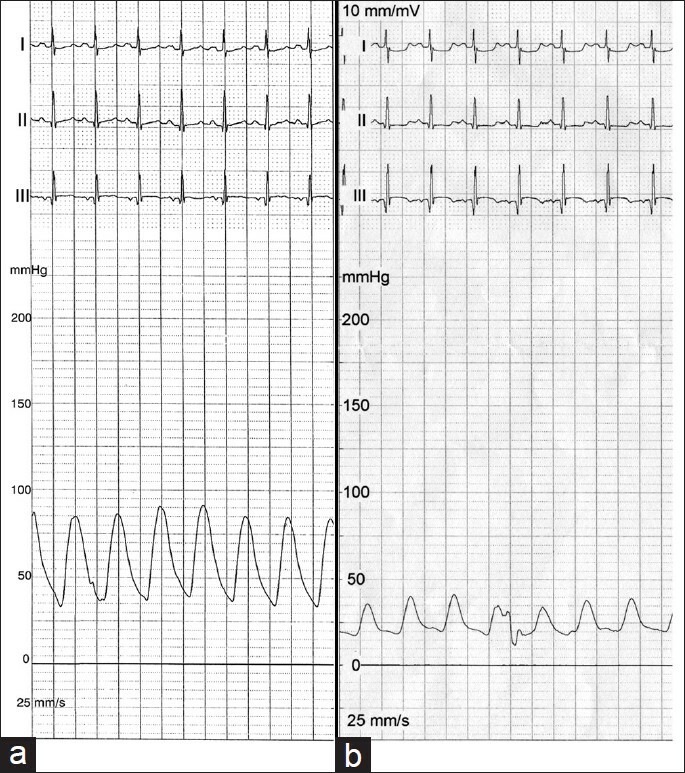 J Am Coll Cardiol 1998;31:878-82. 5. Balzer DT, Kort HW, Day RW, Corneli HM, Kovalchin JP, Cannon BC, et al. Inhaled Nitric Oxide as a Preoperative Test (INOP Test I): the INOP Test Study Group. Circulation 2002;106:(12 Suppl 1):176-81. 6. Mullins CE, 2006. Hemodynamics, data acquisition and interpretation and presentation of data in Cardiac Catheterization in congenital heart disease: Pediatric and adult. Massachusetts: Blackwell Futura; 2006. p. 272-324. 7. Viswanathan S, Kumar RK. Assessment of operability of congenital cardiac shunts with increased pulmonary vascular resistance. Catheter Cardiovasc Interven 2008;71:665-70. 8. Thanopoulos BD, Tsaousis GS, Djukic M, Al Hakim F, Eleftherakis NG, Simeunovic SD. Transcatheter closure of high pulmonary pressure persistent ductus arteriosus with Amplatzer muscular ventricular septal defect occluder. Heart 2002;87:260-3. 9. Roy A, Juneja R, Saxena A. Use of Amplatzer duct occluder to close severely hypertensive ducts: Utility of transient balloon occlusion. Indian Heart J 2005;57:332-6. 10. Dimas VV, Takao C, Ing FF, Mattamal R, Nugent AW, Grifka RG, et al. Outcome of transcatheter occlusion of patent ductus arteriosus in infants weighing < 6kg. JACC Cardiovasc Interv 2010;3:1295-9. 11. Sivakumar S, Francis E. Transcatheter closure of large patent ductus arteriosus in patients weighing less than 6 kg. Indian Heart J 2006;58:5. 12. Anil SR, Sivakumar K, Philip AK, Francis E, Kumar RK. Clinical course and management strategies for hemolysis after trans catheter closure of patent ductus arteriosus. Catheter Cardiovasc Interve 2003;59:538-43.